So you’ve picked out your kitten (preferably two), now what? … Let the training and fun begin! Before your kitten arrives in your home, take them to the veterinarian for an exam, feeding recommendations, and the necessary vaccinations. 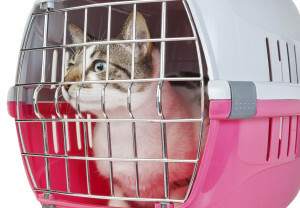 Use a cat carrier for transporting them, both for their safety and for their sense of security. The carrier should become “standard procedure” during any trips away from home. Cover with a soft blanket for added security. Set up a nursery for the baby (or babies if you have adopted two). This should ideally be a small room with an easily cleaned floor. Provide a bed, a litter box, food and water (not near the litter box), items to scratch on, and safe toys. Check out the “Pioneer Pet®” web-site for everything needed. Initiate a schedule of feeding, playing, and handling to provide the kitten with the structure of regular activities. Turning on a small nightlight will be their cue that it is “time for bed” and will also help them to navigate in the room during the night, to find the all important litter box. Be sensitive to the kitten’s need for sleep and watch that children let the baby sleep undisturbed when they are tired out. Handle your kitten gently and frequently for short periods of time. During these sessions slowly incorporate touching around the eyes, ears, paws, etc. as if doing a veterinary exam. This will be good practice for the future. Hold them close to you and Love them. Work with the kitten in their nursery until they are regularly using the litter box. Gradually expand his territory by letting him explore adjoining rooms under your watchful eye. Be prepared for your kitten’s sense of adventure and curiosity. Secure dangerous areas like the dryer and washing machine for their safety. Direct the kitten to acceptable play and scratch items and away from unacceptable ones. When the baby is under three months of age, supervised play is best in areas where they could get hurt or damage something of value to you. Be gentle and kind with a soft loving voice. NEVER yell or hit the baby. The more you involve your kitten in activities and interactions with others, the more likely they will respond without fear or defensiveness as they grow older towards different things. Always treat them with kindness and respect for their (kitten-ness) or “cat-ness”. Remember that kittens grow up very fast and that patience during these early months will pay off later. And…have fun…it’s what kittens do best!